#GoGreen4PS week is almost here! …and hopefully you will already know what you are doing to help us celebrate the week of Monday 25th September – 1st October 2017. But if you are still undecided and want some ideas and inspiration take a look at our #GoGreen4PS fundraising pack with lots of resources to download and make your event as green as green can be! Once you know what you want to do to #GoGreen4PS why not set up a JustGiving page. This is a really easy way to collect donations from your fundraising events and make sure that the money comes straight to Pharmacist Support. Alternatively you can download our donation form, and collect people’s names and addresses so that we can claim Gift Aid on their donation. And don’t forget to take lots of photos too and share them with us using the #GoGreen4PS hashtag. That way we can support your event and add you to our GoGreen4PS Google Map! Remember to help us make some noise by joining our Thunderclap and adding our Twibbon to your Twitter and Facebook profile picture! Together we can raise awareness and vital funds to help pharmacists and their families, Mpharm students, pre-registration trainees and former pharmacist who are most in need. Following a severe health relapse, Emily was finding it increasingly difficult to make ends meet. Read how the help she received from Pharmacist Support helped lift her spirit and improved her situation here. We’d love to hear what you are up to for #GoGreen4PS so please do get in touch if you have any questions or need help planning your event. 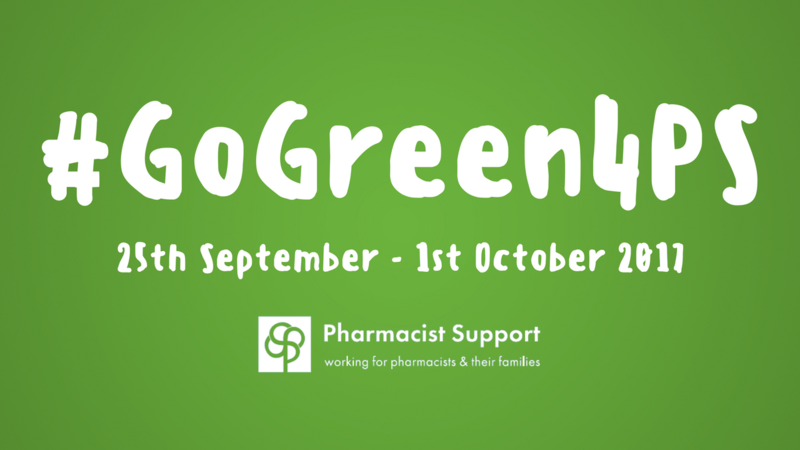 Complete our GoGreen registration form or contact us on fundraising@pharmacistsupport.org, 0161 441 0317.